After 20 dreadfully slow minutes during which several other fans got baseballs tossed to them, I positioned myself here . . .
. . . and ended up getting one from Pedro Feliciano. The best thing about it (beyond the fact that I’d avoided getting shut out) was that he threw it HARD — probably more than 60 miles per hour. On its way to me, the ball had tailed a bit and nearly hit the man sitting on my right — a sportswriter named Jon Hart. He’s the author of a new book called Man Versus Ball, and he was there to take notes and do a story on me. For some reason, the Braves’ pitching staff never came out to play catch, so I decided to pass some time by wandering out to the seats in deep right-center. While standing in this spot . . . The photo above shows a ball in the gutter on the roof of a little structure in the Braves’ bullpen. That’s right — the cover was missing. My first thought was, “If I were to grab the ball, would it be fair/accurate to count it in my collection?” I turned to Twitter for some guidance, and everyone pretty much said the same thing: the ball should count if it IS, in fact, an official major league ball. Of course, in order to determine that, I was gonna have to unravel it, the worst part of which would be getting my hands dirty, but whatever. Citi Field has good bathrooms, and I’d dismantled several balls in the past, including this one. Yes, if this gutter ball were the real deal, I’d know it by the time I got to the core. The only problem was that I couldn’t quite reach it without causing a scene. My fingertips came up several inches short, and although I was able to touch the ball with my glove, there wasn’t enough room in the gutter for me to get the leather around it. Just as I was planning to try to scoop it up with my Braves’ cap, a security guard walked down the stairs and told me to stop. I was tempted to say, “Show me IN WRITING where it says anything about fans not being allowed to reach out of the stands before the first pitch,” but I decided to let it go. To hell with the Mets and their withered balls. Julio Teheran was working on his mechanics, and pitching coach Roger McDowell was (presumably) filming him with a smartphone. It was a good use of technology, but still made me smile. I was almost certain that I’d get a ball when they finished — McDowell had a couple of baseballs in his back pocket — but bullpen coach Eddie Perez tossed it to another fan instead. No big deal, right? People ask for baseballs all the time and don’t always get them . . . right? Well, there was another guy near me who was so pissed that *he* didn’t get the ball that he started yelling at Perez and saying stuff like, “I hope you get hit by a foul ball!” This was a grown man, and okay, fine, he was frustrated that he hadn’t gotten the ball for his son, but still, there’s no excuse for behaving like that, and let me tell you, I gave him an earful. I shouted all kinds of stuff back at him, including, “You know why players act rude when they come to New York? Because of people like YOU!! !” I was really annoyed, not to mention embarrassed for my city. On my way out of the mostly-empty section, I got a thumbs-up from a woman and a subtle head-nod from another fan. Because I’d spent so much time near the bullpen, I missed my chance to say hello to Craig Kimbrel, who’d been signing autographs for quite a while along the left field foul line. All I got was a photo of him . . .
. . . before he said, “Sorry, I gotta go,” and ran off. Just before the game started, I went here . . .
. . . and got a toss-up from Braves 3rd baseman Chris Johnson. Andrelton Simmons (who recognizes me) saw me catch it and shook his head. Of course, he wasn’t looking when I handed the ball to a little kid ten seconds later. I had lots of room to run, but of course there was nothing to run for. Jon asked me lots of questions and took a zillion notes. That looks a lot better compared to how it was three weeks earlier, huh? That was the result of a 90-mph fastball from Mets starter Jon Niese. At the time, I had no idea what had happened, but as it turned out, Heyward had suffered a broken jaw! Thankfully, he was able to get up on his own . 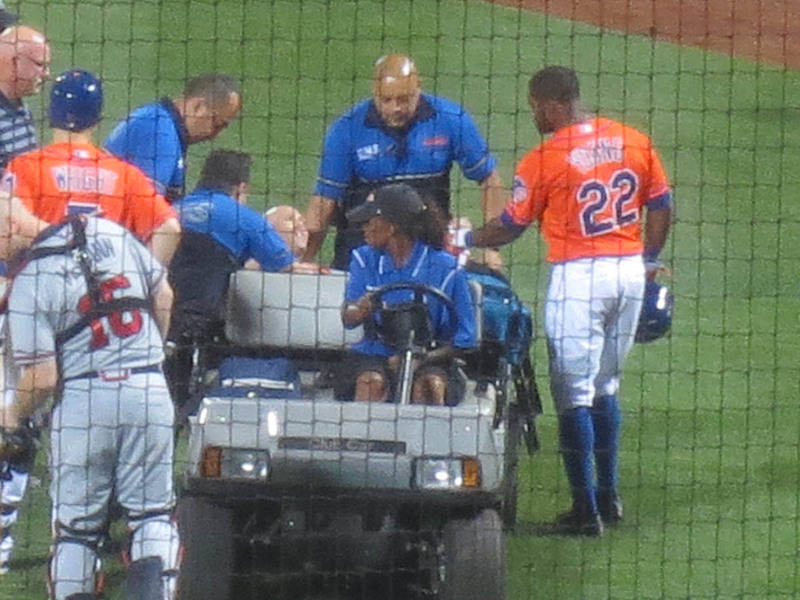 . .
Chris and Garrett were sitting near the dugout and told me later that Heyward was spitting blood — scary stuff, and hey, what IS it with Braves players suffering season-ended injuries whenever I go to Citi Field? Last month, you may recall, I saw Tim Hudson break his ankle and get carted off the field. With the score tied 1-1 in the top of the 8th inning, I left Citi Field so that I could get to Yankee Stadium in time for the start of BP. (I found out later that Chris Johnson hit a three-run homer in the top of the 10th; the ball landed one section to my right, and the Braves won, 4-1.) Garrett stayed for the entire Mets game. Chris and Jon left with me, and we ran into Rick on the way. I was exhausted by the time we made it to Grand Central Station . . . The photos above show me snagging my first ball during BP. Yankees bullpen coach Mike Harkey had thrown it to me, and it fell two rows short. Look closely and you can see me climbing over the seats and reaching down for it. Did you notice the old guy standing on the railing? I was amazed that he got away with it, but then again, not really; certain guards at Yankee Stadium see what they want to see. Take another look at the photo above. See the woman wearing dark shorts at the end of my row? Moments after I took that picture, I sensed that a ball was about to be thrown in her direction, so I hurried over in case it sailed a bit too high, and whaddaya know? That’s exactly what happened. The ball missed her bare hands by an inch, and for the record, she hadn’t even jumped. As soon as I caught it, someone shouted, “Aww, c’mon, ya gotta give it to her!! That was HER ball! !” Another fan heard that and yelled, “That ball was thrown by Mariano!! He should keep it! !” Sure enough, Mariano was standing just below us in the bullpen — so I kept the ball and gave her the one that I’d gotten from Harkey. She was disappointed, and I don’t mean to be a jerk, but too bad. I’m disappointed about lots of balls that I almost caught. That’s life. When the Blue Jays started hitting, I changed into my Jays gear and headed back to right field. After a while, I managed to get one more ball, possibly hit by Anthony Gose, although I’m not sure. Here it is heading toward me . . . Entering this game, Ichiro Suzuki had a total of 3,999 hits in professional baseball — 1,278 in Japan and 2,721 in the Major Leagues. That’s pretty much why I attended this game — not just to SEE him reach 4,000, but to actually catch the ball. Of course, given the fact that he was gonna have to hit a home run (or a ground-rule double) in order for me to get my hands on it, the odds were stacked against me, but the way I saw it, the odds would’ve been far worse had I been home watching the game on TV. He was planning to sign up to be a designated driver in order to get a free soda, and he asked me if I’d do the same (so that he could have two sodas). I said sure, and we were all set to do it when we learned that the Yankees don’t give free soda to designated drivers. Huh?! Since I don’t drink alcohol or soda, and since I don’t own a car, I don’t make a habit of signing up for these things, but I’ve seen enough of these booths at various stadiums to know that teams *always* give free soda — well, except the Yankees, evidently. And get this: if you sign up here at Yankee Stadium, you get a Budweiser key chain as a reward. WTF?! Do the Yankees want people NOT to drink, but to be tempted to drink? I don’t get it. Jon and I had tickets on the lower level in straight-away right field, but Garrett was going to be sitting elsewhere, so we were discussing our plans. With R.A. Dickey on the mound, Ichiro slapped a 1-1 pitch past the 3rd baseman for his 4,000th professional hit. That’s pretty much what I expected, and yes, it was great to witness this historic moment, but on a deeper/personal/selfish level, it was disappointing. The crowd went nuts . . .
Ichiro’s teammates had already spilled out onto the field by that point . . . Many thanks to Andy for taking and sharing so many great photos with me. I know I linked to it before, but here’s his blog. Check it out if you get a chance. I get it. Believe me. I really do. The Yankees failed in their attempt to sabotage A-Rod’s season and get their insurance company to pay his $28 million salary, so now they’re desperate to make money, but jeez, couldn’t they have waited a day? It’s bad enough to see Ichiro in pinstripes, but to see vendors hawking this merchandise . . . I don’t know, man. It really cheapened the accomplishment. Rajai Davis managed to hit a one-out double off him, and before the next pitch, Mariano picked him off 2nd base. You can’t make this stuff up. It was the first pick-off at 2nd base of Mariano’s entire career. Final score: Yankees 4, Blue Jays 2. • 501 balls in 69 games this season = 7.26 balls per game. I wonder how long before someone snags that ball in the gutter? I’m going to be there a week from today and if I remember, I’ll look for it. You are crazy to do a doubleheader on 2 different stadiums! And probably not your first time either. You’re amazing, Zack. You really are. If it’s still there in a week, go for it. This is not the first time that I’ve done the two-stadium thing in one day. I did it three times in 2011, and I had done it before that as well. Great to see you at Citi Field yesterday. Glad to hear you got more than one ball. You’re spot on about the Yankees marketing scheme. Too bad they kept you from snagging the gutter ball as the Mariano toss up would have been your 500th this season instead of the Wells ball. A cool way to celebrate Ichiro’s 4000th hit. Zack, are you going to be at Citi Field Monday night? Same here. Glad you agree. Next time I go to Citi (whenever THAT may be), I’ll bring some type of gadget and make a better attempt . . . if the ball is still there. Yeah, but catching a homer on the fly in BP isn’t too shabby. I think so, but it’s not definite. When it comes to attending games in NYC, it’s always a last-minute decision. I am an avid reader of your blog and admire your dedication to getting balls. I know some are hard on your about your relentless pursuit of balls and not really taking other people into consideration, but I can truly understand that passion and I think you make up for it by giving a lot of your balls to children. That being said, this was the first post where I thought you were a jerk about a ball. I really feel you should have given the girl the Rivera ball. I think you probably felt like you did something jerkish as well because you made mention of it in your post. Again, I understand the desire to get as many balls as you can and I do understand the desire to keep a ball from Rivera, but sometimes you have to do the right thing even if you have been “disappointed about balls you almost caught”. Thanks for your thoughtful comment. I know it would’ve been nice to give her the ball, but I must correct you on something: it wasn’t a “girl,” but rather a grown woman, who was nearly my height and had an uncontested opportunity to catch the ball. I don’t take pity on grown-ups who miss baseballs. The fact that I gave her anything was nice on my part and lucky for her. Normally I only give baseballs to kids with gloves. This was an adult with no glove whom I had never seen before, and I still gave her an object worth more than $20. If I had given her the Rivera ball, I would’ve felt bad for letting it go, so instead, I thought, “If someone’s going to feel bad in this situation, there’s no reason why it should be me.” That may be harsh, but I stand by my decision. Again, thanks for the comment. I do appreciate your thoughts, and I hope my response makes sense. @Ray Burton, and all the good folks from Australia, just read the terrible news of Christopher Lane. Deepest condolences to his family and nation, embarrassment doesn’t begin to describe what I’m feeling right now. Not all our children are so …disconnected. are you going to be at citi tomorrow? i’m going for the first time. is the Pepsi Porch a good place to be for BP for Prince Fielder? I’ve never seen (or at least noticed) a bullpen mound with a team logo on it (much less a visiting team logo). Do you know if the Mets always put the visiting team’s logo on the visiting bullpen mound? Or did the Braves put their own logo down on the mound? To each his own with respect to what *counts*, but, personally, I would not count that ball of string in the bullpen gutter. Fenway doesn’t give you a free soda either after signing up as a designated driver. The only thing negative about every experience I have had at Fenway. I never tried to sign up at Citi Field so maybe somebody can fill us in on whether the Mets hand over a free soda or not. Everywhere else I have been with a designated driver booth you get a coupon for a free soda. And I have even won some other useful stuff as well after signing up in some places. Kslo69 , on behalf of the Lane family , we thank you for your kind words. A truly tragic situation. Very big news in Australia and around the world as I understand. We realise that it is not representative of the people from your fine country but it doesn’t make the pain any easier to bear. We , in Australia , are also suffering from an epidemic of gun crime but nothing like the problems you face over there. Let us hope that we all learn something from this tragedy , but I doubt it will happen in my lifetime. On a lighter note , will MLB recognise Ichiro’s 4000 hits even though a significant number weren’t made against major league pitchers ? And what sort of punishment does a ball receive to lose its cover ? Yeah, I’ll be there tomorrow (Saturday). Fielder hit several balls into the Pepsi Porch today during BP, so it seems like a good place to be. I have no idea about the bullpen. Save your thoughts about the string ball for my next entry because I ended up snagging it. What was the guy doing next to you when you were running into Grand Central Station? Ha! I have no idea. Looks like he got hit on the head and was rubbing the pain away.